The last decade of the twentieth century and the first decade of the twenty-first century has been one of the most challenging periods for the generally accepted assumptions of international law. This book, first published in 2006, grapples with these long-held assumptions (such as the consent basis of international law norms, equality of nations, restrictive or text-based treaty interpretations and applications, the monopoly of internal national power, and non-interference), and how they are being fundamentally altered by the forces of globalization. It also examines the challenges facing the WTO as a component of international economic law, and how that field is inextricably linked to general international law. Part I. Challenges to International Law Fundamental Assumptions: 1. Introduction: International law and international economic law in the interdependent world of the twenty-first century; 2. The real world impinges on international law: exploring the challenges to the fundamental assumptions of international law and institutions; 3. Sovereignty modern: a new approach to an outdated concept; Part II. The WTO: 4. The WTO as international organization: institutional evolution, structure and key problems; 5. The WTO dispute settlement system; Part III. The Search for Solutions: 6. Policy, analytical approaches and thought experiments; 7. Illustrative applications; 8. Perspectives, implications, and some conclusions. 'This is an important work by an important author ... a world-renowned authority on international trade law ... Although the book should be captivating for specialists in the areas of public international law and international trade law, the author has such an easy writing style that even beginning students of these fields of study could readily follow his arguments.' International Trade Law and Regulation 'John Jackson's latest opus offers us a thrilling overview of the changes that have taken place with respect to the concepts of sovereignty and cooperation. ... 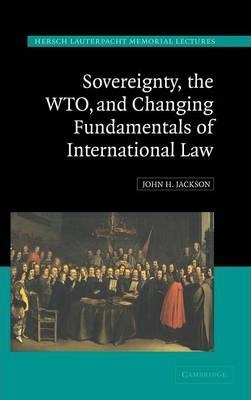 In sum, one cannot but admire the wisdom ('sagesse') of Jackson as one of the founding fathers of the GATT/WTO law discipline, as an insider who played an important role in the building of the WTO and as an eminent expert who has taken the measure of evolving political, economic and legal challenges the WTO has to cope with. A wisdom that one would like to continue to benefit from, while engaging with Jackson in an even more direct manner.' World Trade Review 'The book's account of the workings of the GATT/WTO is a magisterial overview of the field, and Jackson brings to the book an intimate knowledge of the working habits of the organization (or non-organization, in the case of the GATT) and a breadth of view that comes from decades of close attention to its work and to its successes and failures. It is for these virtues that most readers will go to this text. The observations on the theoretical implications and possibilities of the material with which Jackson deals are bonuses, lightening the text and opening up avenues for later exploration.' American Journal of International Economic Law "The book's account of the workings of the GATT/WTO is a magisterial overview of the field, and Jackson brings to the book an intimate knowledge of the working habits of the organization (or non-organization, in the case of the GATT) and a breadth of view that comes from decades of close attention to its work and to its successes and failures. It is for these virtues that most readers will go to this text. The observations on the theoretical implications and possibilities of the material with which Jackson deals are bonuses, lightening the text and opening up avenues for later exploration." John H. Jackson is a Professor of Law at the Georgetown University Law Center.